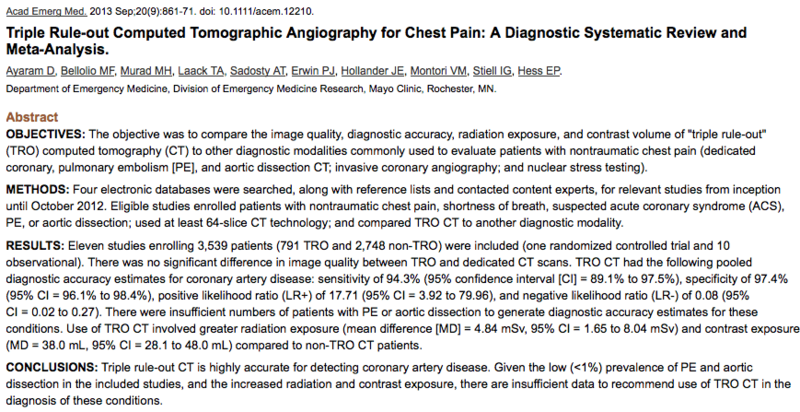 I was glad to see this article published as triple rule out CT for chest pain has been a topic that I’ve heard a little about, but personally it’s not something I use. This troubles me as in Virchester we have a long track record in the investigation of cardiac chest pain and this is an area that might interest us in the future, but we need to know more…..
Mr Smith is 65 and presents to the ED with chest pain. He describes it as having started at rest following a session in the local gym where he is trying to get fit. He had done 20 mins on the cross trainer about an hour earlier and he described the pain as mostly in the centre of his chest with discomfort in his upper arm and upper chest. At the time he did feel a short of breath, sweaty and nauseous and the pain appeared to be worse when he took deep breaths, but to be honest the difference wasn’t that much. He mentions that he has only just got back to the gym following a period of rest as a result of an knee sprain 4 weeks ago (that left him pretty immobile for a week or so). He is a smoker and thinks that his maternal aunt died at the age of 38 of an embolus…, or was it a heart attack??? [DDET What’s a triple rule out scan anyway?] Basically, it’s a CT scan that images the coronary, aortic and pulmonary vasculature to look for coronary artery disease, pulmonary embolus or aortic dissection. This presents some technical difficulties in optimising the scan process to visualise all those areas whilst contrast is passing through different structures at different times. Whilst I understand this principle I would leave the techy details to our radiological chums. There’s a nice review article from Medscape here that explains in more detail how and what TRO CT is. [DDET What kind of paper is this?”] This is a systematic review and meta-analysis of a diagnostic test. It’s worth stopping at this point and asking yourself when you last saw one of those…….., you may struggle to remember the last as they are really not that common (Ed – do you not remember this one?). Diagnostic studies are often difficult to group together in a way that is meaningful during meta-analysis owing to the heterogenicity of the trials and the patients within them. In a systematic review/MA the subjects are the papers and so we need to look carefully at how the authors selected the papers. This should include a selection policy based on whether the paper is relevant to the question asked, and also on the quality of the papers themselves. Selection was based on finding papers that compared TRO scans against ‘another diagnostic modality’, which is fair enough, although I’m really interested to know about performance against a similar gold standard for the final diagnosis. I’m especially interested in understanding what it is we are actually looking for and what the gold standard is….., more of this later. [DDET What papers did they find?] Of 733 papers scanned a final number of 11 were included. This included just one randomised controlled trial. A total of 3539 patients were included across all trials with 791 undergoing TRO scans. Apart from the one RCT the authors found a selection of case control and cohort studies of variable quality, though there were no high quality papers according to QUADAS-2 scores. [DDET Er, but are these ED patients in the EM Journal?] That’s a fair question. I’m reading the paper in Acad Emerg Med so I’ve lulled myself into the impression that this paper is about management of patients in the ED, but is it? In the text I’m struggling to find out whether the patients in these trials are actually patients like the ones I see in the ED. That’s crucial to my interpretation and understanding of what’s going on here. So, back to the paper to find out more about the setting and patient types……, and there’s not that much detail really. I’m still a bit confused and so I’ve resorted to checking the originals out myself. Of the 4 papers looking at diagnostic accuracy (the big outcome for ED patients). Schuchlenz paper: We evaluated 72 consecutive chest pain patients from our emergency department/cardiac outpatient clinic with a low to intermediate likelihood of coronary. Interestingly I can only find this paper as a conference abstract online (this may be my searching prowess…..). Gold standard is unclear but appears to be coronary angiography. Litmanovitch paper: 56 patients in this study with a normal or equivocal ECG and negative cardiac enzymes. Selective use of gold standard which was itself variable. So. That’s an interesting group of patients. This is not an unselected group by any means and the emphasis in the studies seems to be on the radiological aspects of the procedure more than the clinical differentiation of ED patients. This probably also explains the high performance values as this is a select group of patients who will have a higher pretest probability of disease and also a more severe level of disease as compared to an undifferentiated group of ED patients with chest pain. None of these studies come close to meeting the requirements of a diagnostic study for ED patients. I am very reluctant to support this as in terms of diagnostic accuracy we have not seen any studies that meet criteria for a good diagnostic study. Ed – what simple criteria are you using here? Was the reference standard applies regardless of the test result? Was the test validated in a second group of patients? These are based on David Sackett’s work but they are features of many diagnostic checklists. So, basically we can say….no. These studies do not meet criteria for a robust diagnostic study and I think the main conclusion of this study is ‘courageous’ if based on the data I can find in tracking back to the original papers.